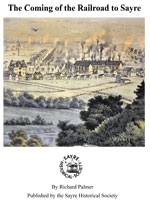 A 60-page soft-cover booklet on the early history of the railroad in Sayre by railroad historian Richard Palmer covers the earliest years of the railroad in Sayre including numerous photographs and illustrations as well as a detailed chronology of events. An addendum to the book includes reminiscences of John Fitzgerald of New Albany on his work experiences with the Pennsylvania & New York Railroad in 1867. Excerpts of a diary by railroad supervisor John Rahm in 1869 detail the construction of the P & NY Railroad which was later absorbed by the Lehigh Valley Railroad. Lists of early locomotives on the P & NY Railroad and Early Lehigh Valley Locomotives Spotted in Sayre - 1869 to 1872 are also included in the fact-filled booklet.